In 1980, Master Craftsmen Gregg Capoano and Carl Capoano, combined their talents to form Capoano Contractors. 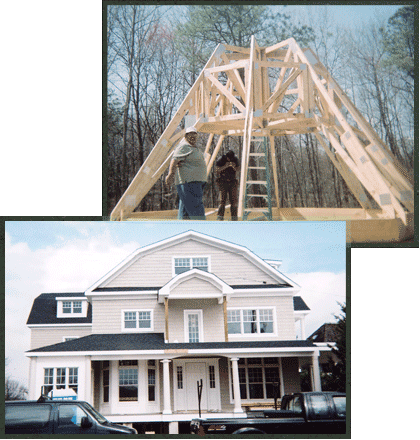 This family owned business takes pride in continuing their ancestors' passion for building/framing. For over 30 years, each brother had built solid reputations as quality residential and commercial builders, focusing on framing and design excellence. Carl Capoano began his own construction company in 1968, building impressive commercial and residential construction throughout the state of New Jersey. In 1972, Gregg embarked in his own specialty trim and finish business. Together, Capoano Contractors has a proven track record as a leading builder, with extensive experience in all facets of construction. Winners of the Fast Frame It contest and named Associates of the Quarter by the New Jersey Shore Builders Association, Capoano Contractors has the experience and project dedication you can count on... now and for years to come. New Jersey Shorebuilders Association, Inc.